He's back! I'm a Koburn fan, as those who read my previous review of his storyline may remember. This is a cracking Rey Carlos cover, with Koburn leaning idly against his pimped up ride. I was expecting a lot from this Meg, and it totally delivered (WARNING: This review is full of over-the-top praise - those who find such things sickening might want to leave now). Where to start? It's all so good... Let's go with Cursed Earth Koburn in the first part of the story Kuss Hard. Once again, Koburn is in his favourite bar in the Cursed Earth - and once again his 'time off' is interrupted by a Mega City Judge needing his help. Not Dredd this time, but Judge Bonaventura, seeking his help in bringing justice to an organ-legging gang, The Kuss's. Gordon Rennie on script and Rey Carlos Ezquerra on art. It's a joy. I was gripped through the whole thing. I just love this character and can't wait for the next instalment. I'm glad (Sir) Alan Barnes commissioned a Koburn series - well done (Lord) Barnes! Moving to Dredd we had Wagner and Chris Weston (yay!) on duty for the first part of the series Six. Weston is absolutely one of my favourite artists. The first page vistas of Mega City One are glorious. The detail in each of the buildings is fabulous - it looks like it took him days to draw all those windows! An important investor has arrived in Mega City One, but is he all he seems? Great set up for this story, lots of mystery and intrigue and unanswered questions. Wagner at his best! Still more great stuff in the shape of The Simping Detective in the story Crystal Blue. As I mentioned in my last review, there is much to admire about this Spurrier and Irving character and they continue to excel in this new story line. Jack Point has been warned off a case by his new Chief, which only makes him more curious. But will curiosity kill the cat (or indeed, our simping hero)? I love everything about this strip; the way Spurrier tells the story, the way Irving draws the art, the throw-away remarks, everything. Great stuff! And then we had Black Siddha. We continue to learn more about the three sets of characters; Rohan and his attempts to be the hero, Rak and his strange cult and the weird goings-on at the youth centre. It's all coming together nicely. Still liking this a lot. Over in the reprints, Charley's War and Hell Trekkers continue to be of a high standard. It's back over the top again for Charley, but this time with the Mark 1 tank. Will they prove the difference in the Battle of the Somme? And our intrepid pilgrims continue to battle through impossible conditions on their way to a new life away from Mega City One. Enjoying both of these stories still. 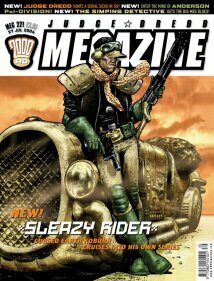 The Metro Dredd this issue was a little better - but not worthy enough for much more of a review than that. No thread on the 2000 AD Forum for this Meg.